The Novak Center for Children’s Health combines different areas of practice that typically a patient may have to crisscross across campus to get to their appointments. Now they are located in one distinct building making it easier for patients and their families. Designed for children without looking childish, the Novak Center takes cues from the region’s indigenous plants, animals and kids themselves. 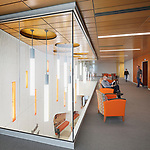 Large glass windows reveal people and activity inside the community spaces allowing the building to seem less mysterious to its young patients. The vivid terracotta cladding on the exterior rain screen is colorfast and requires no mortar or sealants, reducing maintenance. The rain screen system allows air to flow in and out of the wall cavity, reducing the radiant heat load on the façade. The bright panels have a third less embodied carbon than other materials, reducing carbon dioxide emissions. An HVAC system of active chilled beams moves air throughout the building efficiently and sustainably. For the pedestrian bridge the unique attributes of this tight urban site drove the center supported, double cantilever design. Exposed steel girders and beams branch out from central supporting columns. Sloped facades allowed us to use lighter columns and reduce by 22% the amount of steel that would typically be required for a pedestrian bridge of this size. The ceramic frit patterning on the glass enclosure may appear random, but its density or openness reflects the structural forces at work at various points. The frit also informed the meandering ‘streams and pools’ on the floor and dapples incoming sunlight. Sunny or rainy, winter or summer, day or night, playful or serious, walking to the doctor’s office will never be the same.